Goodness what a week. Pete has been gone, and it is like a 3 ring circus here with me trying to juggle the girls, a new puppy, work and all of the family and house responsibilities. Lordy. I’m tired. Speaking of tired. I heard about this thing called a “fitbit” last week and I totally impulse purchased it on Amazon. I got it Monday afternoon and it is awesome. It tells me how active I am and also tracks how I sleep. Last night was the first night I figured out how to track my sleep and it was not pretty. Compared to the night before, I thought I got a decent nights sleep (Wilbur is sleeping through the night now. Amen. ) But my fitbit said that I woke up completely 8 times and partially 16 times. That doesn’t sound good. I mean I know I am a restless sleeper, but I think this is like sleep center bad. I can’t wait to see what happens tonight. Oh, fit bit also confirmed what I already know. I need to exercise more. 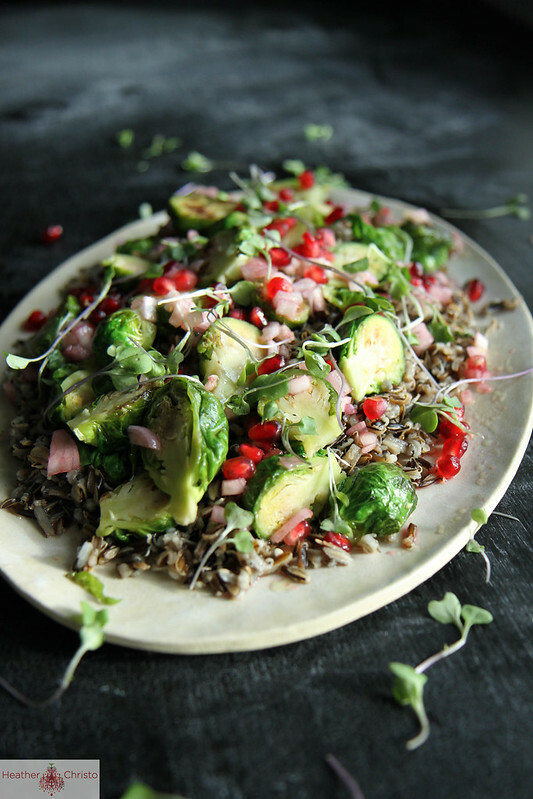 And it has encouraged me to make more beautiful and healthy salads this week like this gorgeous Wild Rice Salad with Brussels Sprouts and Pomegranate Vinaigrette. I have Thanksgiving on the brain, and I think this would be a perfect side dish. It sort of kills 2 birds with one stone (grain and veggies?) or if your family likes to just have tons of sides and loves rice, I would vote for this one! I have a couple weirdo’s in my family that would choose rice over mashed potatoes (can you belieeeeve it???) so they would be into this. 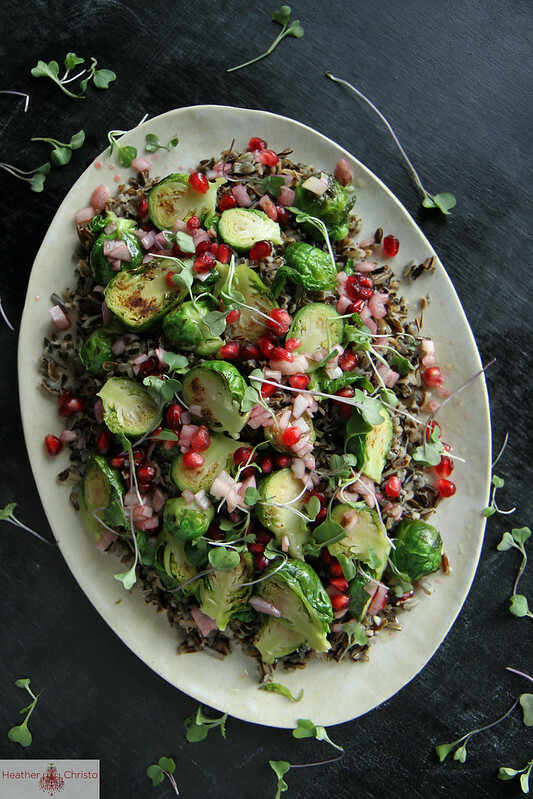 It’s a great mixture of nutty wild rice (I used Trader Joes), crunchy brussels sprouts and a sweet and sour pomegranate dressing. I also love the crunchiness of the shallot and the little sweet and bitter pomegaranate seeds. It also happens to be a very pretty dish, don’t you think? So lots of you have asked how the new puppy is doing. 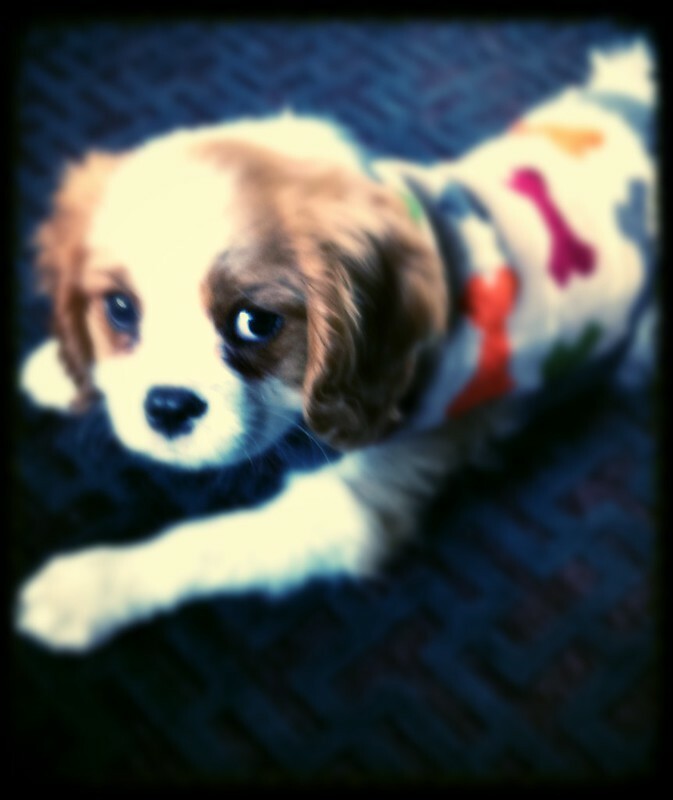 My darling little Wilbur who is getting so big (not really, he isn’t even 8 pounds yet). He is a little champ in the crated up night sleeping department, but still having a hard time potty training during the day. I can’t remember how long this part takes? I must have blocked it out after Mason, for whom I remember having to purchase a large and expensive carpet cleaner to contend with his accidents. But I am still obsessed. I am considering getting him his own instagram feed so mine is not just completely puppy pictures. What do you think? Would you follow him? To make this salad, this is what you do? Cook the rice According to the manufacturers directions. Rinse with cold water and drain. Set aside. Heat a large heavy sauté pan over high heat and add the olive oil. 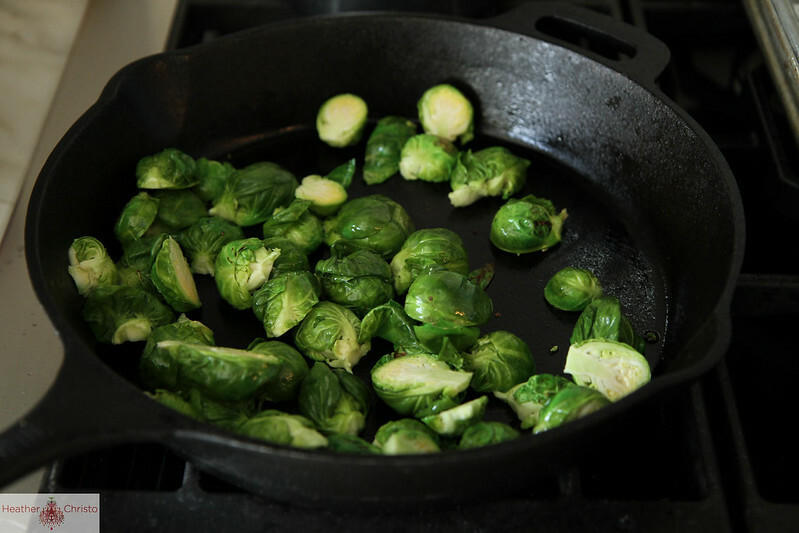 When the pan is really hot add the Brussels sprouts. Cook over high heat for a two minutes. Some of the sprouts will start to get browned. Lower the heat to medium-high and add the chicken broth. Season well with kosher salt and black pepper and let the Brussels sprouts cook until tender another 5 minutes. Add the Brussels Sprouts to the rice and toss gently. In a small bowl, combine the red wine vinegar, juice, olive oil and shallot and whisk together. Season to taste with salt and pepper. 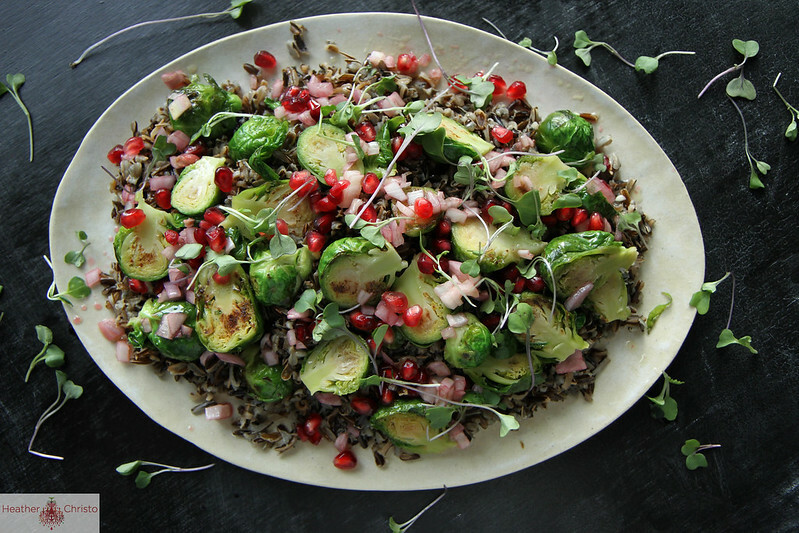 Add 2 tablespoons of the pomegranate seeds to the dressing. Toss the whole salad with the vinaigrette and then sprinkle the salad with the pomegranate seeds. I also garnished with a few microgreens or you could use some freshly chopped parsley. Heat a large heavy sauté pan over high heat and add the olive oil. When the pan is really hot add the Brussels sprouts. Cook over high heat for a two minutes. Some of the sprouts will start to get browned. Lower the heat to medium-high and add the broth. Season well with kosher salt and black pepper and let the Brussels sprouts cook until tender another 5 minutes. 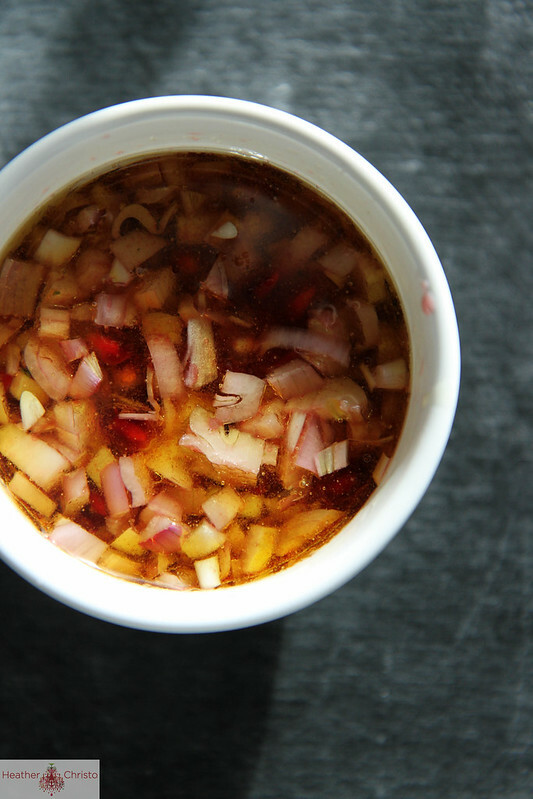 In a small bowl, combine the red wine vinegar, juice, olive oil and shallot and whisk together. Season to taste with salt and pepper. This is so full of goodness! 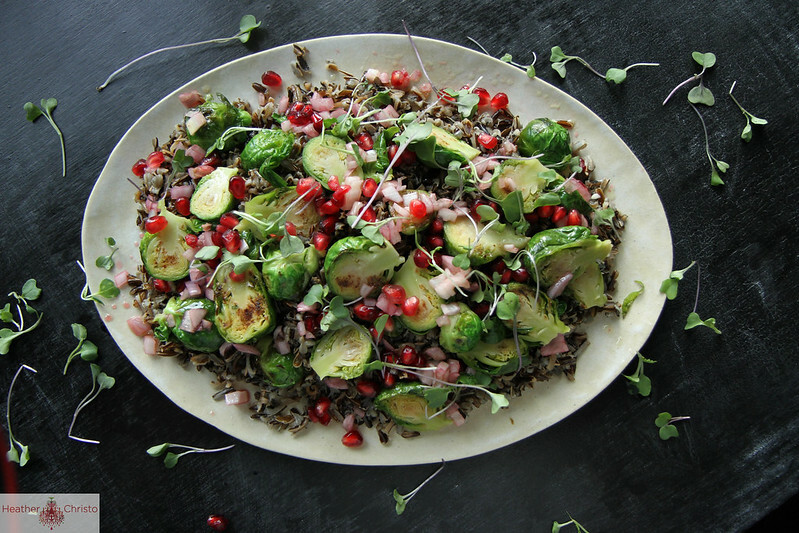 Love the pomegranate dressing! Gorgeous salad. Looks like lunch. I just got the Fitbit! But haven’t used it to track my sleep, though. I was up 3x with a feverish baby last night…so I can guess it’s reading won’t be great for me! So pretty! I just made a wild rice Thanksgiving dish and have leftover rice. This salad is happening!